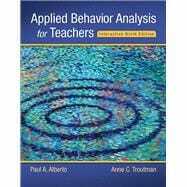 by Alberto, Paul A.; Troutman, Anne C.
Note: This is an interactive updated edition of Applied Behavior Analysis for Teachers 0132655977, copyright 2013. Scholarly and empirically based, yet friendly and accessible, this text shows teachers how to use the principles of behavior analysis to create their own recipes for success. Through classroom-based examples and practices firmly grounded in research, Applied Behavior Analysis for Teachers gives teachers powerful ways of dealing appropriately and ethically with some of the most challenging behaviors students display. It takes readers through the entire process, from identifying a target behavior to collecting and graphing data, selecting an experimental design, conducting a functional analysis, arranging consequences, arranging antecedents, and generalizing behavior change. The authors’ emphasis on making the text readable and user-friendly features numerous examples describing students from preschool through young adulthood functioning at various levels of ability, and teachers ranging from excellent to poor, with many relatable examples of good teachers who learn from their inevitable mistakes. The Enhanced Pearson eText features embedded videos and assessments. After receiving her undergraduate degree in elementary education from the University of Georgia in 1964 Anne taught elementary grades for 5 years. She completed her Master’s Degree in special education from Georgia State University and taught students with behavior disorders in self-contained and resource settings and served as a crisis intervention specialist and special education supervisor. After receiving her Ph.D. from Georgia State in 1977 she taught graduate and undergraduate students in general and special education at The University of Memphis until her retirement in 2009.